Published: Aug 1, 2016 to ? At Grace Field House, life couldn't be better for the orphans! Though they have no parents, together with the other kids and a kind "Mama" who cares for them, they form one big, happy family. No child is ever overlooked, especially since they are all adopted by the age of 12. Their daily lives involve rigorous tests, but afterwards, they are allowed to play outside. 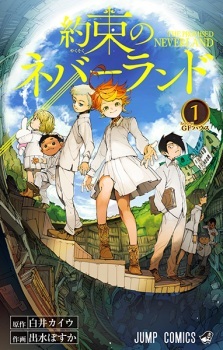 As a part of the JUMP START initiative, the first three chapters of Yakusoku no Neverland were published in English as The Promised Neverland in VIZ Media's digital Weekly Shonen Jump on the same day as the Japanese release. After, the series was added to VIZ Media's Weekly Shonen Jump lineup. The publisher has been physically releasing the series since December 5, 2017. The series has also been licensed in Polish by Waneko, and in Spanish by Norma Editorial. This manga, albeit very new has gotten my attention well enough to prompt me to write a review. With the ending of popular series like Bleach and Naruto, myself and many other people have high expectations from the newer generation of authors. And I believe that the authors of Yakusoku no Neverland have great potential. YnN starts off with Emma, a happy go lucky girl who spends the days of her life in pure bliss along with all the other orphans. All the kids there enjoy their carefree everyday activities like playing tag, eating delicious food, and taking an extensive IQ test with absolute focus... wait. It is at this moment you realize that this is no ordinary orphanage, but the kids who grew up there are completely oblivious to that. It is not until Emma witnesses the horrible truth about the purpose of the orphanage that is encircled in walls that she and some other orphans begin to wonder about mysteries outside the orphanage. I kept my summary vague to keep the element of mystery intact, which the authors do a phenomenal job of keeping you intrigued while still maintaining a steady pace. It is especially important because that is one of the aspects that keeps you coming back for more. The other one are the characters. The main character Emma is at first glance the typical shounen character beaming with optimism. Her character is somewhat reminiscent of Gon from Hunter x Hunter, that is, a feral, stubborn, bright, but also very calculating. In fact all the main characters are depicted to be smart in their own way and for a good reason. Unlike many shounen characters who are frustratingly stupid, the characters in this manga would do and think about all the things the readers are thinking. My only fear for this manga is that it hopefully won't reveal it's overarching mystery too soon, and characters don't stay true to what they are already established as of now. But the way the authors are going, makes me hopeful that they know what they're doing. Could this potentially be the new Hunter x Hunter? One can only hope. I will update this review after this manga has reached Ch. 100 and blown up in popularity. I've given it a 10. Based on 10 chapters. I rarely give 10. And to think I picked it up because I was searching for substitutes for Bleach!!!! The story is extremely fast paced. It developed in 10 chapters what SnK had taken nearly 1 years to. 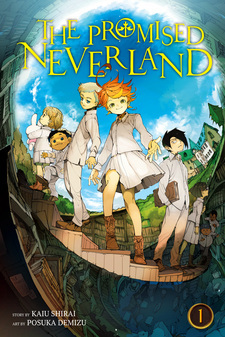 It revolves around a group of trio; Emma, Ray and Norman as they try to escape from their orphanage. Every chapter in this manga has new developments, new progressions. Exquisite! The art of the manga is chibi-ish. But considering that we are looking at boys and girls under 13 years of age, it's very apt. I believe in the potential of the manga. Truthfully, I WANT to believe in the potential of the manga. Honestly, I am a great fan of dystopian fantasies. I truly hope that this becomes a great manga, doesn't reduce to a crawl like SnK did and, on the day that this manga reach the stage where it is known worldwide and people eagerly wait for the anime adoption, I'd be happy. I'd be happy because I found a gem in the dirt, and I would be the one to recommend this to others. I'm proud of this manga, and would like to see it recognised. Being a relatively new manga, I'll be basing this review off of the currently released chapters. I've never reviewed a series so soon after the original release, that's how good this manga is. I'd honestly like to give it a higher score... but because I'm only going off of the few chapters that have been released, I have to give the story a 9 for now. The story is EXTREMELY original, well-paced, with just the right amounts of darkness and lightheartedness. I'll just be reading along, and all of the sudden, my stomach balls up, turns over, and shrivels with tension and real fear. Best part?... only takes one turn of a page to do it. Jaw dropping. Magnificent. Bubbly, rounded and soft at all the right times (with all the right characters), yet sharp, angular, and intensely disturbing just when you're not (quite) expecting it. Detailed backgrounds and characters provide for an wonderfully immersive experience. Like with the story line, I can only give this an 8.5 for now because I'm waiting on further character development. But for me to be so invested in and attached to these characters with so few chapters released... doesn't happen often for me. Happens rarely, in fact. Each character is complex and interesting in their own way. They bring out of you real affection, suspicion, and intrigue... as well as the dark rumblings of a fear you don't yet fully understand. And then read this manga. You won't be sorry.